A tour of Tour De France news sites - Étape 5: Eurosport / Yahoo! Like the majority of cycling fans, I have been watching this week's events in the Tour De France unfold with dismay. Most other weeks, someone claiming to be from ETA letting bombs off on the route would be a major story, but yesterday with the expulsion of yellow jersey wearer Michael Rasmussen and the exclusion of the Cofidis team, that hardly seemed to matter. Of course, there is an argument that says that out of the couple of hundred riders who started the race, only three have come under the suspiscion of cheating - and the Tour's testing regime is catching them. However, I wonder how many of the new fans that cycling won during the spectacular Grand Départ in London will still be fans after the repeated scandals to hit this edition of the Tour. During the course of this week, as the news focus has shifted from the road to murky medical goings on in hotel bedrooms, I've been reviewing news websites for the depth, quality and usability of the coverage they are providing of the Tour De France. So far I've looked at the official site, and coverage from the BBC, France 24 and The Guardian. When I did get to see any of the action on television in Greece, it was on the Eurosport channel, via satellite, at a bar just down the road from where I live. Throughout the coverage, viewers are directed to get more information at Eurosport's site. Eurosport recently entered into a web partnership with Yahoo!, to build what they hope will be Europe's leading sports portal. From the front page the coverage of the Tour De France is prominent, with Cycling featuring as one of the main navigational tabs, and a Tour De France graphical banner appearing near the top of the page. The Yahoo! / Eurosport Tour De France homepage contains an impressive array of content. 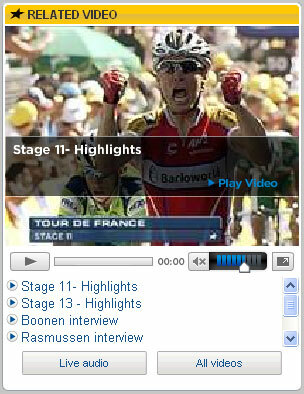 As well as comprehensive news stories, there is an interactive guide to the stages of the race. This takes the form of a cartoon strip indicating the profile of each stage. Selecting an individual stage presents a thorough overview of that day's racing, including the results, a detailed profile, and descriptions of the locations of the start and finish. Eurosport are also making the most of their television coverage on the web, with an embedded video player showing highlight reels and interviews with the leading cyclists. Eurosport also has a unique feature that they have been using during their TV coverage, and which is also available to users on the web. Their GPS information feed tracks the cyclists along a map of the route in real-time. The site has messageboards, and it looks like it has the usual community on a TV station website, having a go at anything and everything to do with the coverage, with threads like "British Eurosport Coverage PATHETIC!!!! ", "Who the hell is 'Vinookaroff'?" and the charming "Geraint Thomas is Welsh you thick twats" - the kind of abuse I remember well from my days hosting on the BBC's Points Of View messageboard. On the more positive side, each day there is a thread where you can ask questions of the commentary team, and they often address these in the broadcasts. In fact this can work two ways - and I noted that unable to answer a question during Stage 14 about whether a 'lanterne rouge' had ever also won a stage during the course of a Tour, the commentators threw the question back to the community and urged anyone who knew to leave the answer on the site. However, it seems a lot of the questions quickly degenerate into more insipid moaning about Seán Kelly having the audacity to sound Irish, and not liking the re-vamped Yahoo! format of the messageboards. I have to say that this kind of cliquey moaning from most of the regulars on the boards has deterred me from participating, as they seem very intolerant of anyone who doesn't live and breathe cycling. Aside from the unwelcoming punters in the messageboard area, I only have one gripe with the Europsort / Yahoo! portal, which is the non-standard way that they handle their cycling RSS feed. The latest contents of the feed are flicked through on the page by an interactive ticker, but to subscribe to the RSS you have to click an RSS icon within the ticker itself. The feed isn't auto-discoverable from the page, and to see what other feeds are available from the page the user has to use a drop-down menu within the ticker to select other sports. The Eurosport / Yahoo! portal is available in English, French, German, Italian, Spanish, Russian, Chinese, and there is also an English language international edition. I'm not sure that the co-branding works terribly well at the moment though. Throughout this article I've been unsure whether to call it Yahoo! / Eurosport, or Eurosport / Yahoo!, or just Yahoo! Sport, or just Eurosport. On TV they get around it by simply calling it eurosport dot yahoo dot com. On the whole though, whatever you call it, the Yahoo! / Eurosport coverage of the Tour De France is vastly superior to that offered by anybody else, including that of the official site, and they look a shoo-in for the maillot jaune in my survey. Next I'll be looking to see if the coverage in The Telegraph can get anywhere near challenging them. By Martin Belam on 26 July 2007. Good question about Lanterne Rouges - I don't know of any winning a stage in which they were Lanterne Rouge, although Jimmy Casper's stage win in a different Tour is notable. What is the email address of the commentary team for the Tdf. I would like to ask some questions with regards to permissible haemocrit levels, i.e. Haven't the UCI or whoever set the standard for a haemocrit of under 50 to be permissible created a problem for themselves and teams? Surely if that's the case then riders and team managers will use means in order to keep that level. So that then raises the question of , "how does a persons haemocrit change and become high" I know one answer will be through dehydration but in a closely monitored team and with the knowledge we all have today about hydration, I don't think that that would be a relevant reason. The other thing that bugs me is how did the Halfords and GB rider Rob Hayles have a high haemocrit and yet although not being allowed to compete in the Track Championships he is still allowed to race on the road? So is the GB squad keeping rides haemocrit artificially high by means other than natural?????? ?